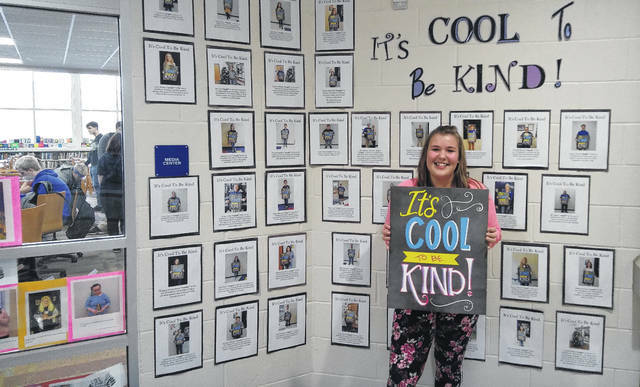 Felicity Matthew was recently chosen for the “Cool to be Kind” award at Gallia Academy High School, a special recognition for doing something kind to others. Behind her on the wall are pictures of all the other students to have been recognized for being kind. CENTENARY — Is it cool to be kind? Students and teachers at Gallia Academy High School seem to think so. What started out as a way to encourage and promote random acts of kindness has evolved into a school-wide program that honors students and staff for doing good. Initially, only staff could nominate students, but eventually the art class created a special box that anyone could submit someone else. They can remain anonymous when they do, but they have to give a reason why they chose that person. Bailey has been choosing two students a week this year, as the box is perpetually full of suggestions. Once a student is chosen, they cannot be chosen again. About 60 students have been recognized so far this year for random acts of kindness. When a student is chosen, their name and a brief description of what they did is hung on the wall in the main lobby where everyone can see. Recognition is all the students receive for an award, and the joy of being encouraged to do kindness. The most recent student to receive the award did not expect to get it. “Well Ms. Polcyn thought I was kind because I like to help and teach other students how to do stuff. In English I walk around and help people on their English and homework, stuff like that,” said Felicity Matthew. Mr. Houchens also nominated Matthew for her generosity during a recent food drive, when she contributed a large box of food. Bailey explained that Matthew’s look when she found out was pure surprise. Students and staff will continue to be nominated through the school year. According to Bailey, it’s always cool to be kind. Reach Morgan McKinniss at 74-446-2342 ext 2108.